What are the measurements for this towel when folded? Folded this towel measure 8cm x 21cm approx. How many towels are there in 1 pack? There are 2100 towels in this pack. Are the towels plain white or do they have a leaf on them? This is an embossed towel. 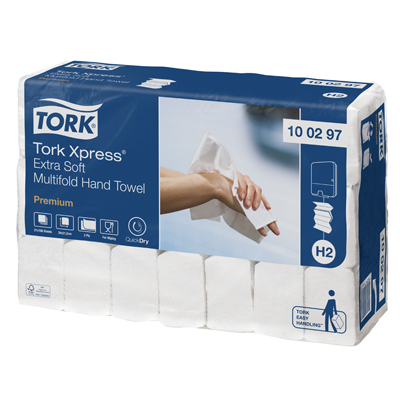 If you're searching for the softest of tissues, the Tork Premium Extra Soft Z Interfold Hand Towels are a fine choice. Each one has been designed to offer high absorbency along with strength, even when wet. They have a lightly embossed design that further heightens the soft finish with an interfolded pack that allows you to remove a single tissue at any time. Perfect for drying hands after washing, this large and economic pack of hand towels is ideal for busy work environments. These hand towel have been designed for use with the Tork Interfolded Paper Towel Dispenser H2.